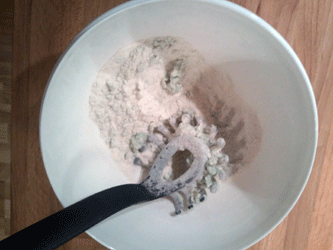 This unique playdough recipe uses alum, a common household item. It is a fun spin on the traditional playdough recipe and you should definately give it a try. It might not be as exciting as the Glow in the dark playdough recipe, but the food coloring gives it a nice finish. Pour the dry ingredients into a bowl and stir. Then, stir your food coloring, oil and water together. 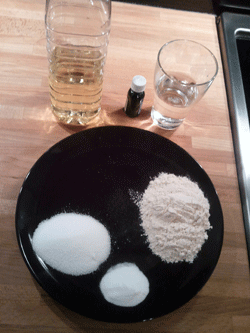 Pour the liquid into the dry ingredients carefully while you mix them together. Then knead the mixture until desired texture is achieved. I bet you found this to be just as easy as I did the first time you tried it. The really great thing is that all the ingredients are common and you will most likely not have to visit the store to be able to make this playdough recipe. This recipe is best stored in a plastic containter in the fridge, that way it will last alot longer. If you’re hopeless on the kitchen (just like I am), here’s a step-by-step explanation with images for you. Dig into the kitchen cabinets and find all the necessary ingredients. Here we have alum, flour, salt, water, oil and food coloring. 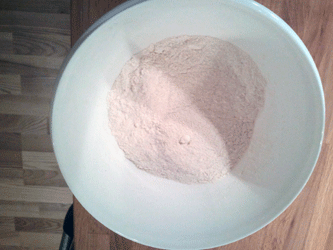 Mix the dry ingredients in a bowl, just stir them together. No surprise that it will look like this. 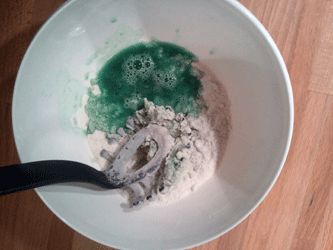 Mix the liquid ingredients in another bowl, without the food coloring it will look like this. Oily water basically. 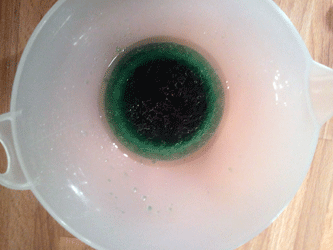 When you add the food coloring (if you want to) things will look a bit more interesting. Alien green I would call this. Now that you have the dry ingredients in one bowl and the liquid ingredients in another, carefully start adding the liquid to the dry ingredients, while stiring. As the image below shows, it will be lumpy in the beginning. Keep pouring the liquid and when you get to the point below, loose the hardware and start kneading with your hands. It will be sticky and gooey, but the texture should change rather quickly. 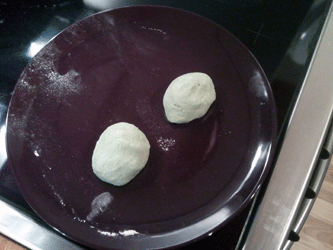 If you find the playdough to be a bit wet, add more flour and salt. Finally you have the finished playdough. Now it’s time to create something nice, good luck! If you like playdough recipe instruction videos better, take a look at our alum playdough recipe video below. The salt playdough recipe is very easy, try it. What function does the alum serve in this recipe? 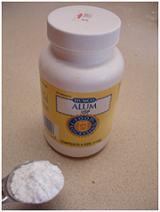 Just happened to find 2 bottles of alum (making the salt dough play dough right now) and wondered. It must add something that’s not in the salt recipe. Here is one you don’t have. Bread Dough: Take a slice of bread and peel off the crust. 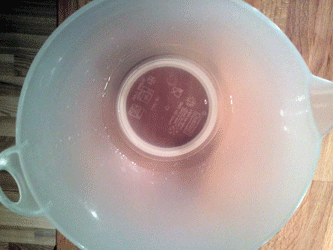 Tear into pieces and place in a plastic cup for easy clean up. Add 1 tablespoon of Aleene’s Glue and stir with a plastic spoon or popsicle stick until it all joins together and forms a tiny ball of dough. Take it out of cup and knead some more. Makes a lovely porcelain type dough. Makes great tiny porcelain hard roses for jewelry or magnets or anything you can think of. It’s the quickest, easiest and most durable play dough I have ever tried. Enjoy! Add a little more water and oil until you get the right consistency. Add a bit more water and oil. You need to hydrate all of the flour particles so that it will stick together. Like your bread recipe. Could someone help me to find a recipe for paper mache(spelling). The once that has been mixed in huge dirt drum for use in primary school. I have loads of egg boxes and toilet roll cartons/would want to use them for this purpose. Can someone help;please. curious, is this a good recipe for kids to make something that will dry? i’m looking for a recipe for air dry clay that the kids can make something that will dry hard for them.